Gaelic for Mothers and Others training. The Gaelic4Mothers&Others initiative is an innovative way to introduce mothers and other women to playing Ladies Gaelic Football. 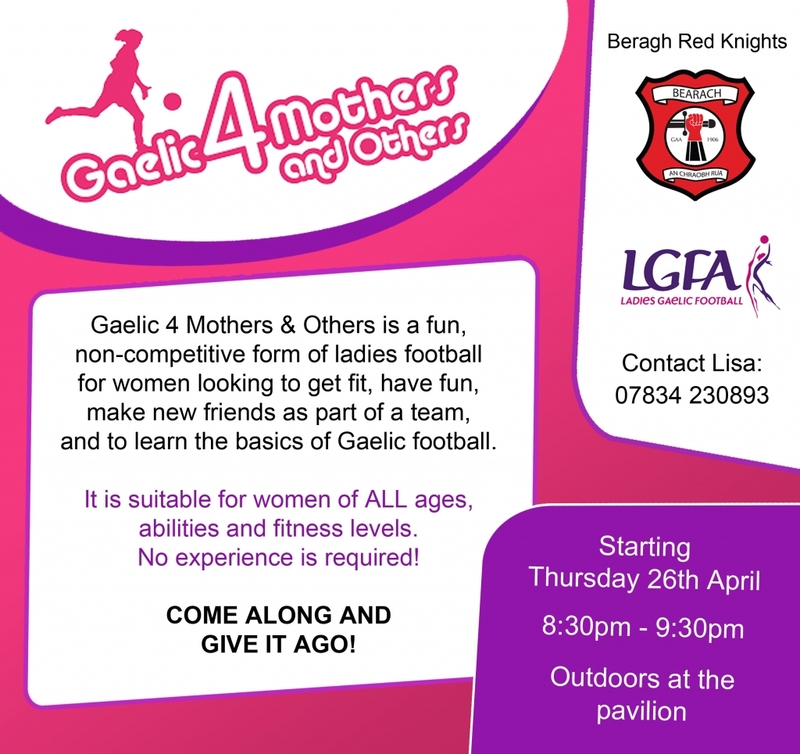 Mothers often drop their kids to training and call back to collect them, but the Ladies Gaelic Football Association wants to change that, and we at Beragh Red Knights want to change that too! The Gaelic4Mothers&Others initiative sees women of all ages and abilities playing Gaelic Football in a fun, non-competitive and social environment.It provides an opportunity for women to get their recommended weekly exercise in a fun way while meeting other mothers in the area. The initiative has proved hugely popular with women of all ages and has taken off in all 32 counties with success stories popping up all over the country. You could be a past player or you could have no experience at all. It doesn’t matter. Anyone interested in joining the craic/training just turn up, you would be made very welcome. Training takes place on the training pitch at St.Mary’s Park pavilion on Thursday evening, 26th April starting at 8:30 – 9:30pm. Come along and give it ago!